Posted November 3, 2010 by Emmet Farrell in News. DELAYED flood relief work on Claregalway bridge is expected to begin before Christmas once an extensive archaeological survey has been completed. 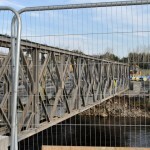 It had been hoped to have the works started before now but a revised plan involving the putting in place of two Bailey type temporary bridges across the Clare to prevent major traffic disruption on the N17 has added to the complexity of the plan. A temporary road has to be run through the field in front of Claregalway Abbey and as this whole area is of archaeological importance a complete survey is required before works can begin. Galway Co Council and the OPW (Office of Public Works) have undertaken approximately 40 flood relief projects throughout the county which they expect to prove of great value if water tables rise again this winter. The work had proved a learning curve for the Co Council as this is one of the few times when the authority had had to engage directly in such major flood relief operations.